Transport Projects are delivered by MK Highways in conjunction with their service provider (Ringway). We undertake around 75 schemes each year, these vary from individual parking control works and installation of new bus stops to complex Road Safety schemes constructed on our highway network. Each project is identified by a dedicated service team in relation to a specific transport issue/objective and undergoes feasibility studies prior to funding being allocated, this is followed by statutory consultation before being classified as a 'live' project and detailed design can then be started and Early Contractor Involvement (ECI) takes place to maximise any operational benefits during this phase. Once a design is agreed the works are programmed, roadspace is booked and the project is delivered and managed by the MK Highways client team to ensure the works are carried out in accordance with the design and to the correct specification. 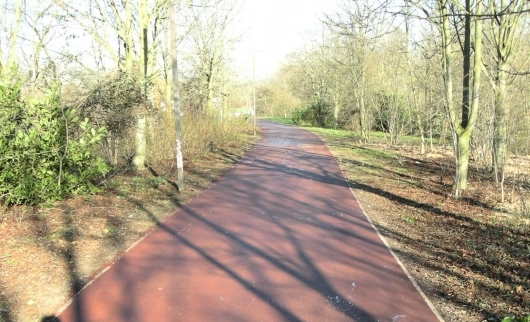 Cycling and Walking: Wayfinding project on MK Redway network, Upgrade of existing Redway routes to 'Super Routes', provision and installation of additional cycle storage. Traffic Management: Traffic schemes to assist traffic flows and reduce congestion such as the signalisation of roundabouts or redesigned junction geometry to assist traffic and the fast and efficient movement of people and goods, this also aids congestion, air quality, and road safety. Road Safety: Schemes directly related to a specific safety issue such as junction redesign to address known accident 'blackspots' or the installation of safety related signage or lining schemes. Parking: Installation of new parking areas, changes to parking signage and re-lining of parking areas or double yellow lining areas. Smart Technology: Installation of SMART devices to monitor traffic flows and parking to reduce network congestion, Installation of Urban Traffic Management Control (UTMC) system to manage traffic signals and traffic congestion, Installation of Variable Messaging Signals (VMS) to provide 'real time' traffic information. Smarter Choices: Installation of Electrical Infrastructure for Electrical Transport (buses and electric cars), trials of autonomous PODS for footways, trials for fully autonomous vehicles on MK road network.